medium, provided the original work is properly cited. velopments in the area of psycholinguistics. and far-reaching implications of this area of syntactic theory. sion to the studies recently put forth. the same syntactic position (i.e., directly preceding nouns). above mentioned word classes as well. definite and specificity features in Italian, among other areas. and/or agreement (Wiltschko, 2009: p. 64). noun phrases is more like that of I (inflection) to verb phrases. It is the head of the noun phrase, and dominates it syntactically1. plement NP instead of being the specifier of the NP. (1) He sees dogs in the street. checked by the presence of the. are required to check the features of their respected categories. an empty category will hold its place. [specific] and [definite], previously assumed to be the same. definite] feature from the addition of other features (p. 101). (3) The book of the woman. (4) *The woman’s the book. possession, it makes sense to treat it in the same manner. sible options for determiners specific to English. same phrase, or before a possessive pronoun or even on its own. of (7) and the ungrammaticality of (8). the treatment of adjective phrase modifiers and noun phrases. Consider the following examples of nouns in subject position (p.
in Italian but not in English. is the case of nominal gender agreement in English (e.g. was assumed to be [+ masc] is actually completely unmarked. their respective determiners (be phonologically identical). those that are not similar in their morphemes. Lit. : Crisis of the energy. Lit. : Pulp of the melon. In (18), the meaning is that of prototypical melon pulp. difference in their distribution must be inherently semantic. can be interpreted as definite, even without a definite marker. for some other function (e.g., “focus” as described above). to carry more functional features to make up for this loss. being done in this research area. a vestido (i.e., this would posit the LF “*la-fem. vestido-masc. the gender and number of the noun, even if that noun is implied. plays a semantic role that otherwise would have been arbitrary. this instance to merit the extra attention to null noun agreement. ders whether or not this feature parameter is even acquirable? that have the concept of nominal gender in common? de Garavito and White (2002), two major issues still remain. own right has compelling evidence in different fields of study. in both directions (p. 128). 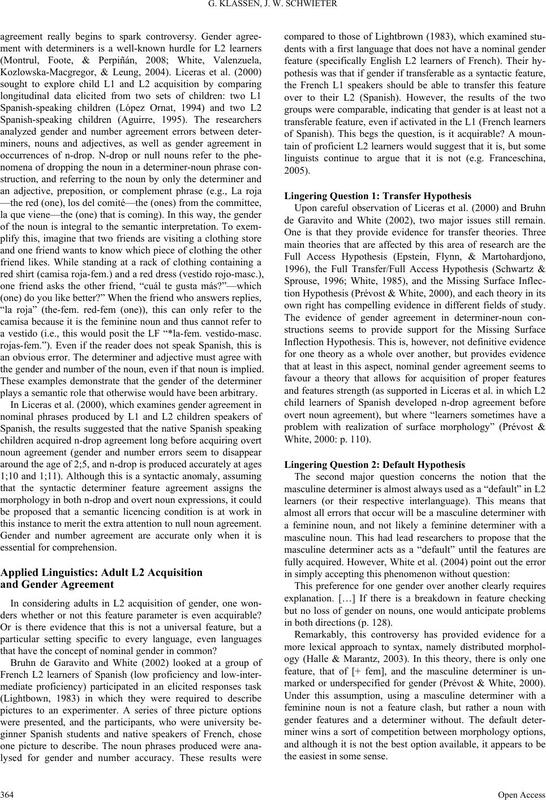 marked or underspecified for gender (Prévost & White, 2000). the easiest in some sense. 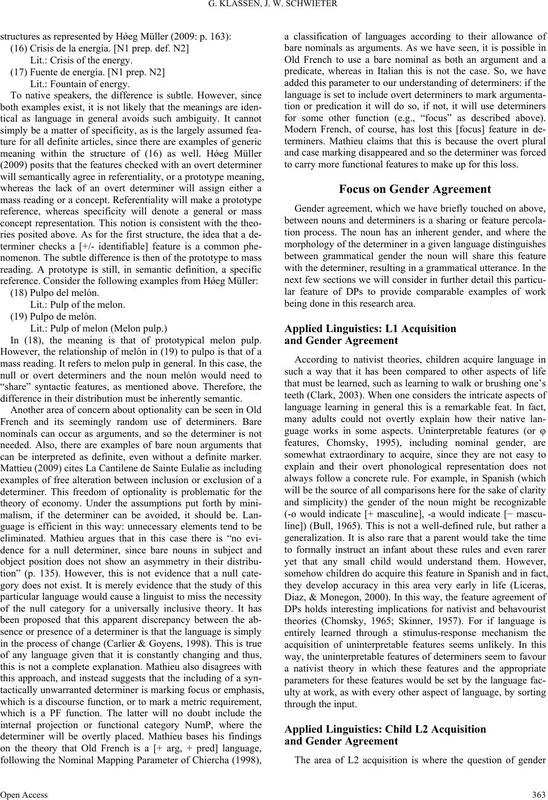 tics: Adult L2 Acquisition and Gender Agreement” Section). help unravel the questions concerning why this pattern occurs? Abney, S. (1987). The English noun phrase in its sentential aspect. Aguirre, C. (1995). The acquisition of functional categories in Spanish. DPs: The status of grammatical features. In A. T. Pérez-Leroux, & J.
L1/L2 connection (pp. 151-176). Dordrecht: Kluwer. Regression of zero degree determination and restructuring system. Cahiers de L’Institut Linguistique de Louvain, 24, 77-112. Linguistics, Cambridge, MA: Massachusetts Institute of Technology. sterdam: John Benjamins Publishing Company. search. Brain and Behavioral Sciences, 19, 677-758. Ghomeshi, J., & Massam, D. (2009). The proper D connection. In J.
tem. 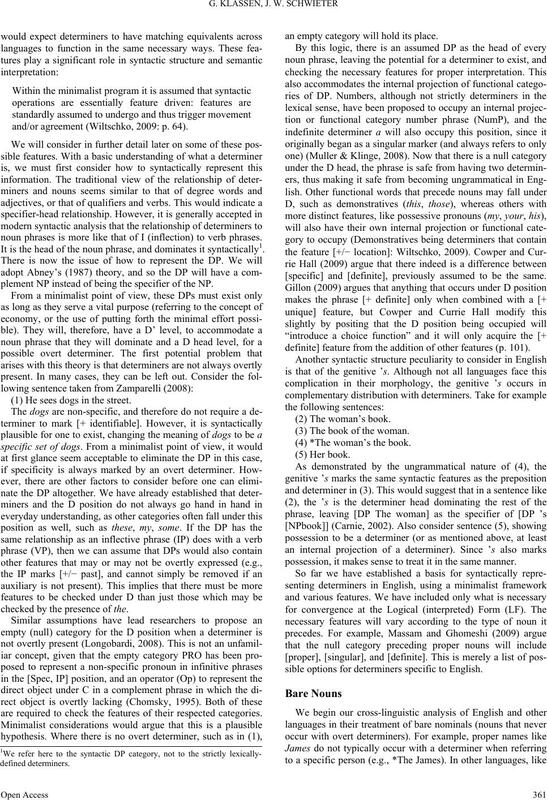 Bilingualism: Language and Cognition, 1, 67-81.
from building 20 (pp. 111-176). Cambridge, MA: MIT Press. Müller, & A. Klinge (Eds), Essays on nominal determination (pp. 163-188). Amsterdam: John Benjamins Publishing Company. and instructional sequences in L2 acquisition. In: H. Seliger, & M.
quisition (pp. 217-243). Rowley, MA: Newbury House. (Eds. 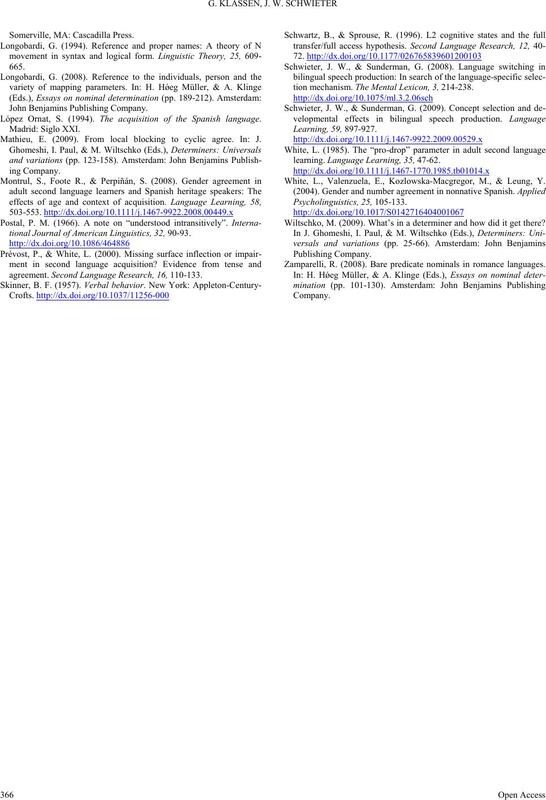 ), Current research on the acquisition of Spanish (pp. 67-96). López Ornat, S. (1994). The acquisition of the Spanish language. Mathieu, E. (2009). From local blocking to cyclic agree. 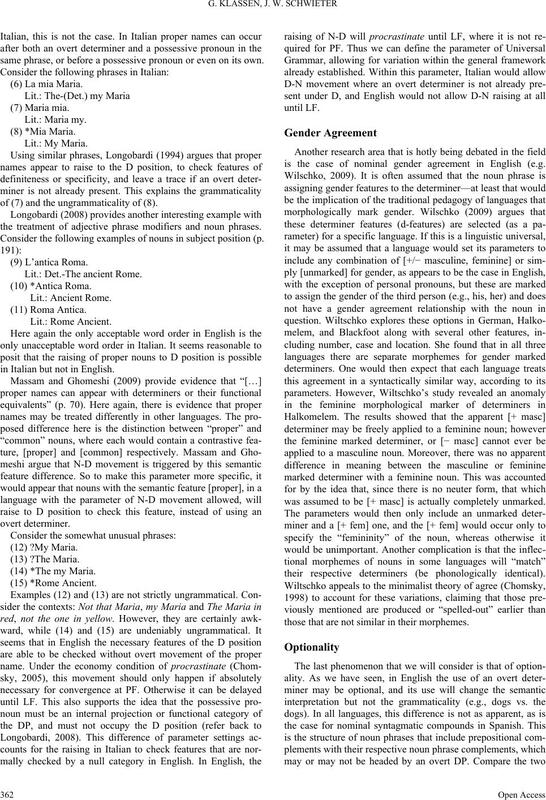 In: J.
tional Journal of American Linguistics, 32, 90-93.
agreement. 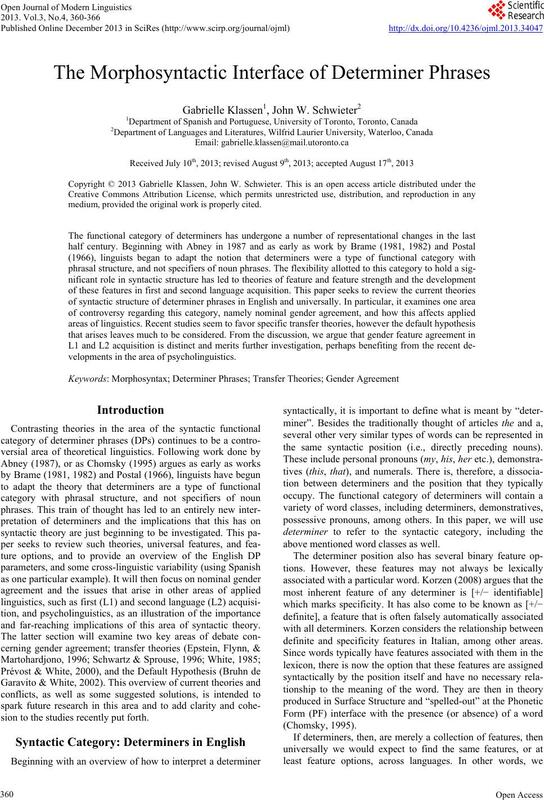 Second Langua ge Research, 16, 110-133.
tion mechanism. The Mental Lexicon, 3, 214-238.
learning. Language Learnin g, 35, 47-62. White, L., Valenzuela, E., Kozlowska-Macgregor, M., & Leung, Y.
Wiltschko, M. (2009). What’s in a determiner and how did it get there? Zamparelli, R. (2008). Bare predicate nominals in romance languages.